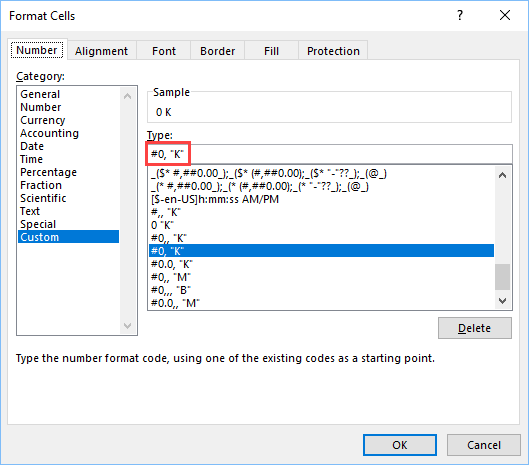 If you have a very big number or very narrow cell, you probably want to format your number in the way that will fit inside this cell, especially when the precision is not that important. In order to demonstrate that, we are going to use the following example. You can copy this example. The numbers in cells B1 and C1 are quite small, therefore we don’t need to format them in any way. But D1 and definitely E1 are too big and it’s hard to tell at the first glance whether they are millions or billions. One to do it is by using the 1000 operator. It will separate thousands with commas. But these numbers are still huge and we want to have a cleaner look. In the following example, there are two ways to format numbers. The first doesn’t have a decimal place, and the second one does. In column B, you have formats that you can use in order to achieve these results. In order to use them, select the cells and use the right-click in order to open the contextual menu. Select Format Cells…. The Format Cells windows will appear. Inside the Type field, type a number format, eg. #0, “K”. The first example is good for hundreds and thousands. The second one is good to use for numbers that are between thousand and a million. In a similar way, you can format millions, billions, etc. Just add an additional comma.